Single Cask Nation Craigellachie 9yo (63.7%): I have a sample from Single Cask Nation's double cask Craigellachie release sitting on my desk today... 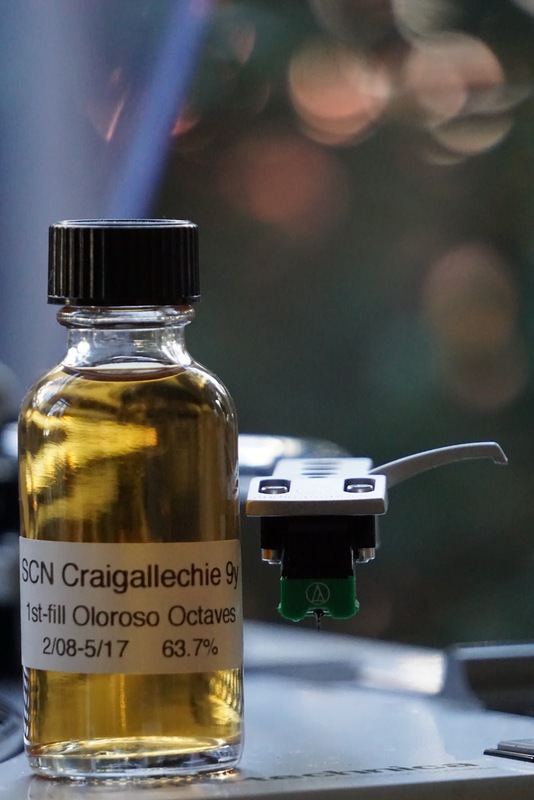 It is called "double cask" instead of single cask this time because the whisky is actually a vat of two first fill Oloroso sherry octaves filled initially in February 2008. and then bottled in May 2017 yielding only 140 bottles. It was sold out within hours after they announced it on their website. Color: Medium amber, honey with thin but slow legs around the glass. Nose: Four berry jam, white chocolate and sweetened sour cherry juice. Noses very much like a young sherried blended whisky... Sugar cookies, almond milk and burnt rosemary sprigs. Candied almonds and caramel flan. Hints of sulphur with struck matches but not at a disturbing level. It amplifies tad more right after adding water but again fades away quickly. More white chocolate and rice pudding. Palate: Darker and spicier notes on the palate compared to the nose: Bitter chocolate, chicory coffee and cacao nibs. Way too hot for me at this abv, have to add some water... Chai, nutmeg and rhubarb pie. Bunch of oak, pine needles and Christmas cake spices. Spiced black tea, lavender, cardamom and stewed root vegetables. It shows the youngness of the spirit a bit but I am quite enjoying it. Finish: Long with baking spices, ground espresso and nutmeg. Overall: It has definitely the weight of a much older whisky on the palate thanks to those worm tubs. It is thick, meaty and concentrated but also keeps you on your toes by being hot and spirity driven by its fairly young age. Very dynamic... Again very textured and off the beaten path release from the duo of Single Cask Nation. These guys don't like safe bets and that's why we like them... Thanks to Josh Hodas for the sample.